It’s South Haven week on the blog. I spent a lot of time there last week and had the opportunity to eat meals at a lot of places I haven’t been to yet. A co-worker and I were there on Friday and we had a lot of time to kill. It was actually him who suggested we go get lunch and try to kill at least an hour someplace where we weren’t sitting in our car. We ate at Gino’s East just a few days earlier so I knew that was out. I asked C.W. what he was in the mood for and he just said someplace he could get a sandwich. I picked Six Chicks Scratch Kitchen because it’s the kind of place we wouldn’t normally eat at while we’re in town for the beach. 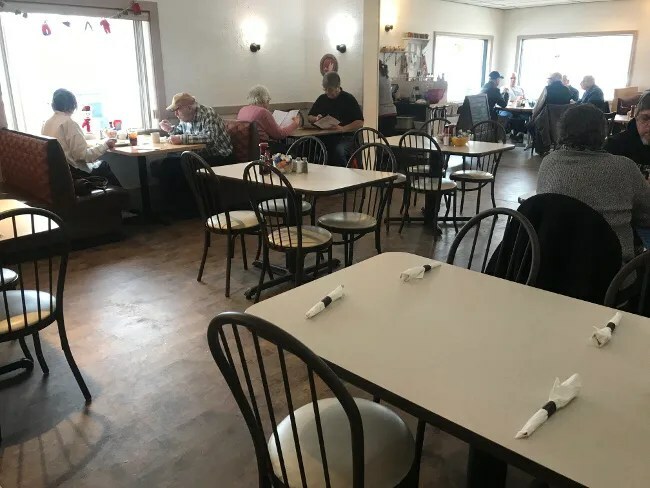 It’s more of a breakfast/lunch place…the kind of place we would definitely eat at often if we lived or were vacationing in South Haven before hitting the beach for the day. 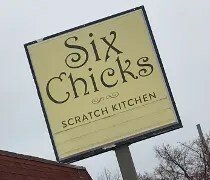 Six Chicks Scratch Kitchen is on Broadway Street right at the intersection with Michigan Avenue. The business was previously a Chinese buffet. The building sits right along the busy street which is also M-140. There’s a small parking lot on the south side of the building that was full. We ended up parking on Michigan Avenue and walking back to the restaurant. The restaurant is pretty much one big open room. There is a lunch counter to the left when you walk in behind the host stand. The wood laminate floors, neutral walls, and simple furniture give the restaurant a clean, homey vibe. The hostess apologized for not having any open booths and asked if a table would be ok. It really didn’t matter to us. A table is a table. We just wanted to eat. The menu is simple home cooking. Breakfast is available all day and lunch after 11:00. I was seriously looking at the breakfast menu but couldn’t bring myself to pass up a burger. I picked the Bacon Cheeseburger. 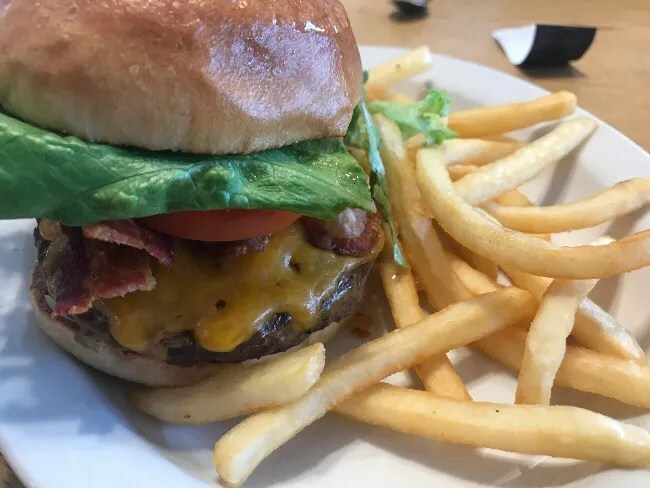 The simple, no frills burger is topped with smoked bacon and choice of cheese…I picked cheddar. The fresh meat burger comes stacked with the typical accompaniments…lettuce, onion, pickle and tomato. The waitress asked if I needed mayo or mustard while ketchup was on the table. The burger itself was quite juicy and very tasty. The cheese was melted perfectly over the top and that was covered in a layer of crispy bacon. The sandwich came with fries on the side. These were simple, frozen fries in which I should have asked for that mustard for. My co-worker did the breakfast thing ordering the California omelette. This thing is stuffed avocado, bacon, tomatoes and jack cheese. It comes with sour cream and salsa on the side as well as a side of potatoes. The house potatoes on his plate really made me wish I had ordered breakfast. They looked delicious. We got our checks separated so I’m not sure what the overall total was but my sandwich and Pepsi was a little over $11. 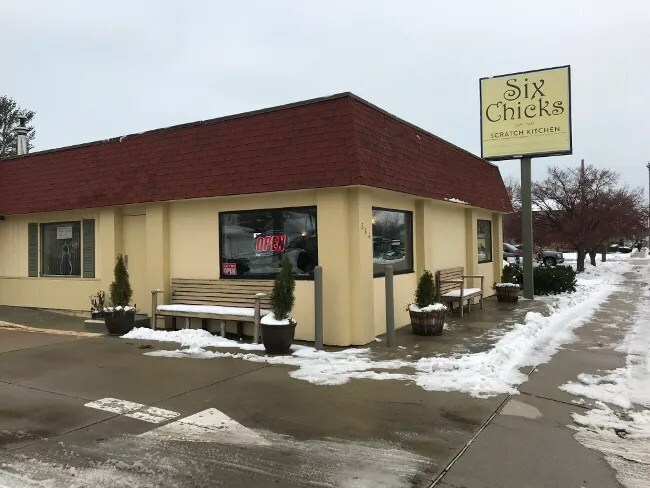 Six Chicks Scratch Kitchen is a great local diner. At lunch time, there was a good mix of regulars meeting up for a sandwich and coffee as well as groups like us who stopped in on their lunch break. This is a the type of local diner every community needs. It’s more than just delicious food. It’s a community gathering spot.